Perform advanced maneuvers and procedures skillfully and safely. The Piper Seminole has clearly established itself to be the best multi-engine trainer available today. With over twenty years of proven service, both students and instructors can appreciate its ability to perform advanced maneuvers and procedures skillfully and safely. All aircraft feature a standardized avionics suite that eases the transition between aircraft. Only ATP can offer you this level of certainty and peace of mind when it comes to aircraft availability for your training and flight checks. For over 35 years, ATP Flight School has been the nation's leader in providing professional, accelerated multi-engine flight training. With 93 Piper Seminoles, ATP has the largest fleet of multi-engine trainers — all dedicated for use in the Airline Career Pilot Program. The stability and controllability of the Piper Seminole makes it an ideal aircraft to learn the intricacies of multi-engine operations. Many similarities in cabin design and function between the Piper Archer and Seminole, make the transition from single to multi-engine flying simple. 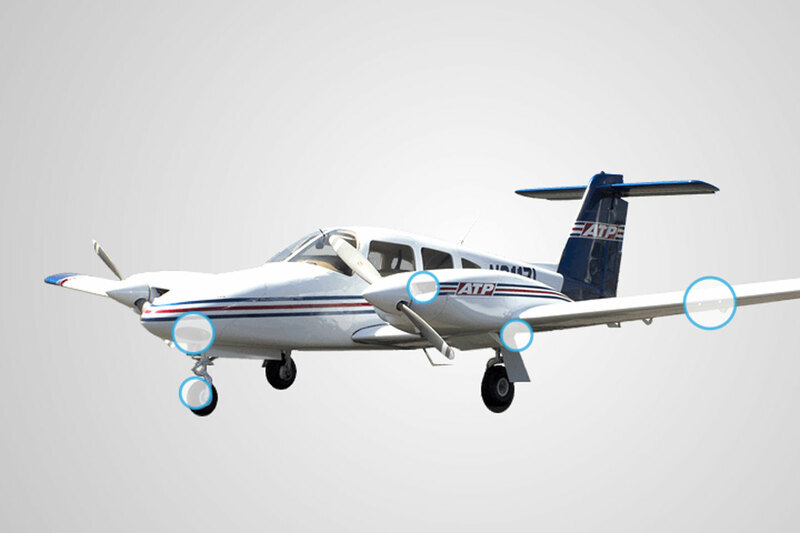 ATP Flight School features two models of Piper Seminoles. Pictured here is the '79 model, with a conventional instrument panel layout and Garmin GNS 430 moving-map GPS. Nearly 80% of ATP's Piper Seminole fleet are newer '00 models, featuring either a conventional panel (pictured) or Garmin electronic flight deck. All of ATP's Piper Seminoles feature Garmin GPS, with many newer models also coming equipped with the Garmin G500 avionics suite. ATP's dedicated and safety-focused maintenance department keeps your training on-time with reliable aircraft professionally maintained. Experience the ATP difference on an Introductory Training Flight. Important Notice: Do not use information listed without referencing the full information described in the approved Owner’s Manual, POH, or POH/AFM specific to the airplane you are flying. Endurance and fuel capacities may vary considerably depending on the specific model / serial number being flown and any modifications it may have. Get to know the multi-engine Piper Seminole. Learn more about the Piper Seminole and preview ATP's self-study training modules with a free online lesson. Get started on your training today by completing the PA-44 Exterior Overview module. The following training centers feature multi-engine Piper Seminoles.